At Cane Creek, we strive to make best-in-class products that provide exceptional performance and rider experience. During the initial production of the DBinline rear shock, we did not live up to this promise. We have determined that certain DBinline shocks manufactured from May 23, 2014 through September 15, 2014 have graphics that incorrectly identify the adjustment directions for High Speed Rebound (HSR) damping. We are extremely sorry for the confusion this may have caused and have corrected this mistake. HSR on the DBinline shock is decreased by turning the adjuster counter-clockwise and increased by turning it clockwise. The incorrect graphics direct the opposite; that is, the plus(+) and minus(–) symbols are transposed. Following these directions will cause unexpected behavior by a bike's suspension and pose a fall hazard to a rider. 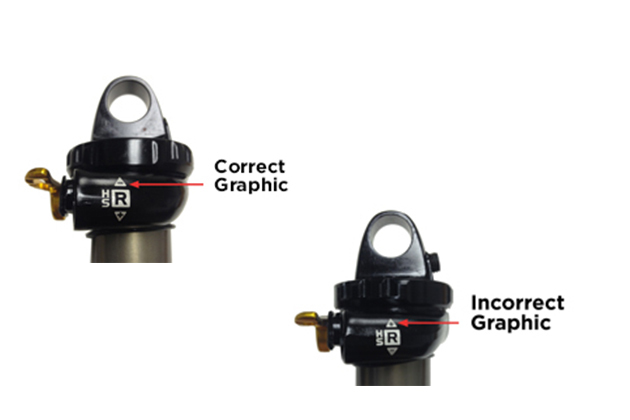 To remedy this issue, Cane Creek will provide a repair decal kit that indicates the correct adjustment direction. Please note that, with corrected HSR graphics, these shocks are performing as intended. Customers should refer to page 18 of their Tuning Field Guide (available online at http://www.canecreek.com/resources/products/suspension/tfg_english.pdf) for correct adjustment instructions. To remedy this issue, Cane Creek will provide a repair decal kit that indicates the correct adjustment direction. Cane Creek encourages consumers to obtain a repair kit as soon as possible by reporting the in the form below, emailing us at hsrlabel@canecreek.com or call our Recall Hotline at 1.844.490.3663 or 828.209.4480 Monday through Friday, 9AM to 5PM EST. Please have your serial number handy. For more info – CLICK HERE. Cane Creek sincerely regrets any inconvenience this situation may have caused you. Everything we do at Cane Creek is aimed at making our products the best in the world. We know that you expect this from us and we will keep working to meet this high standard.